Duration: Long term. W2 employees preferred but C2C will be considered. Market salary, benefits - Health Insurance, Life Insurance, Paid vacation and Holidays. The mission of Domino Technologies is to provide clients with IT solutions for their individual business processes that lead to strategic market advantages. Since its founding in 1996, Domino Technologies has built a solid record of performance working with clients in the private sector and government. *‘ Top 50 Fastest Growing Company Award’ from Central Penn Business Journal. *Tier-1 vendor for the PA Information Technology Staff Augmentation contract and major IT vendors. *Domino Technologies, Inc. is an equal opportunity employer. 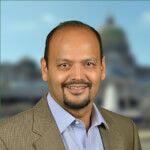 Nathan Balagopal is the president of Domino Technologies, Inc. His role is to set the strategic direction for the organization and to continuously look over the horizon for the new technology solutions that will meet ever-evolving customer needs. Building strong professional teams, creating strategic business partnerships with clients and candidates alike, he focuses on getting his team to create sustainable value for all stakeholders. He has over 29 years of experience in designing and building Information Technology solutions for large commercial and government customers. As an IT consultant, Mr. Balagopal has played a primary role in architecture, designing, and developing web application solutions for several customers in Commercial and Public sector past 19 years. With an in-depth understanding of processes and expectations, Mr. Balagopal has worked closely with managers, staff, and subject matter experts at PennDOT. Mr. Balagopal received his MS in Industrial Engineering from the University of Texas and is also a certified technology specialist on TOGAF, IBM and Oracle software. Mr. Balagopal actively volunteers in the local community and supports several non-profits including Cumberland County Library System Foundation.